The Death March to the Sea is an annual hike from the San Fernando Valley in LA to the Pacific Ocean during the hottest part of the summer. While it is ruled by a odd set of bylaws that govern when and how it will take place, everyone is welcome. It has also developed a rather bizarre culture over the years. 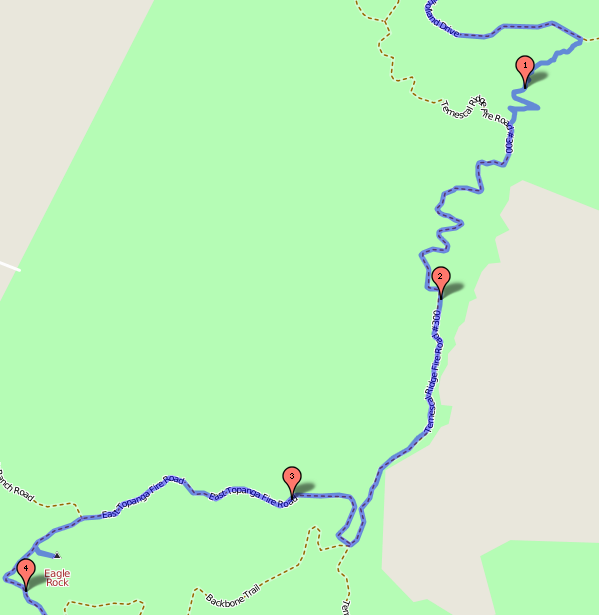 The general route can be found here. Please note that each year, the route may have been a little different. In 2009, Travis generated the first gps track of the March (now lost). This provided a wealth of information about the route. 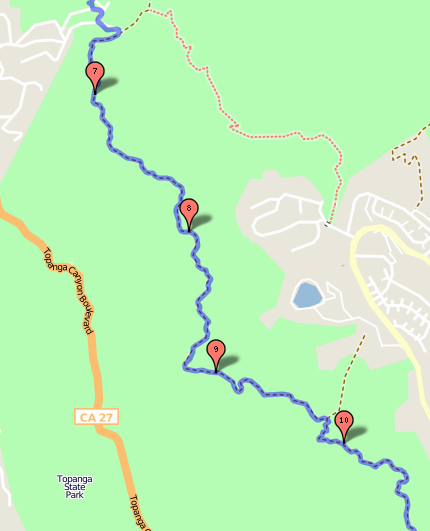 The first part consists a route to the cougar warning sign on Mulholland Drive. The official route runs begins on Reseda at its dead end on a large hill past several expensive homes, onto the fire road which runs along a hill crest to Mulholland, and slightly east along Mulholland to where the cougar sign resides. The previous route started farther down at the Caballero Canyon trailhead. In recent years, the top of Reseda option has been the official starting point due to the fact that parking and meeting there is much easier. 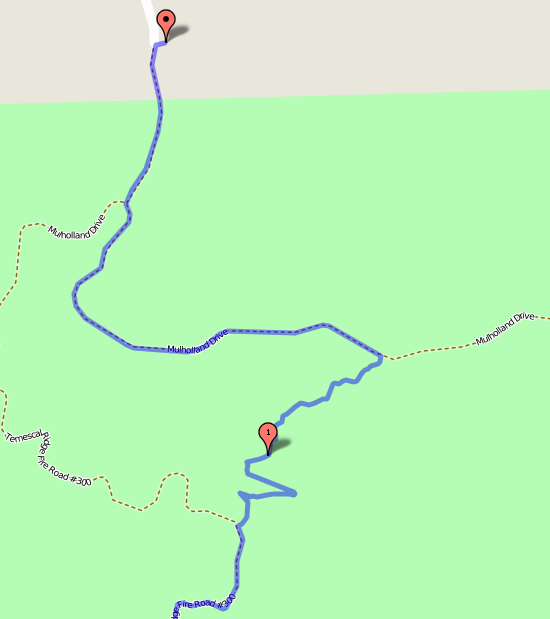 From the cougar sign, there is a narrow windy trail that connects to Temescal Fire Road. One generally travels along this winding, yet well maintained, trail to reach the Hub. An alternate route cuts over the ridge along a firebreak. The shortcut is of debatable use due to the intense elevation changes. Technically, one could take the Garapito trail as well. There is a rather tough uphill stretch just before the hub. The hub is a central area marked by an information sign and a shade structure at which many of the major trails through the park meet. In years past, the members of the hike would stop here to drink and munch on a few snacks, with some people attempting to make use of the scant shade provided by the (previously) small sign. There is now a toilet and a more permanent installation. This was removed as an official stop to provide for more fun at Eagle Rock, but is still a logical waiting point. One has to be careful to head up and right on the East Topanga Fire Road to reach Eagle Rock. 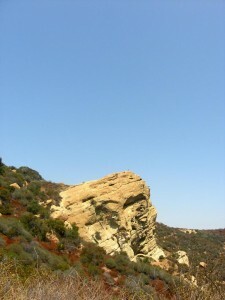 The Red Rock Area is a part of the trail along the East Topanga Fire Road where the iron content of the soil is very high, and the landscape is rather Martian in appearance. 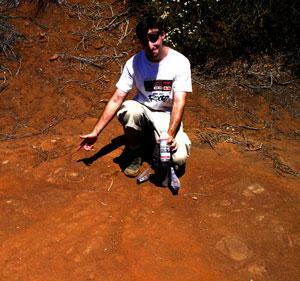 Mike often comments about the stromatolites in the area. The trail loop going through this area and Eagle Rock was not incorporated into the hike until the second march. Previous to this, the Eagle Springs Fire Road was used. Eagle Rock (also known as the “Most Dangerous Lunch Spot on Earth”) is a very large rock formation which vaguely resembles a perched eagle when viewed from its backside. The hike members eat lunch in a small cave near the eagle’s “head”, which was filled with colorful paintings by various artists (or perhaps only one; no one is quite sure of this) of a (probably) liberal political persuasion. In 2011, the inside of the entire cave had been painted gold. Eagle Rock also became the main location at which the Punishments are inflicted (although technically, Punishments may occur at any point). Eagle Rock is where the “Photogenic” Achievement can be earned. 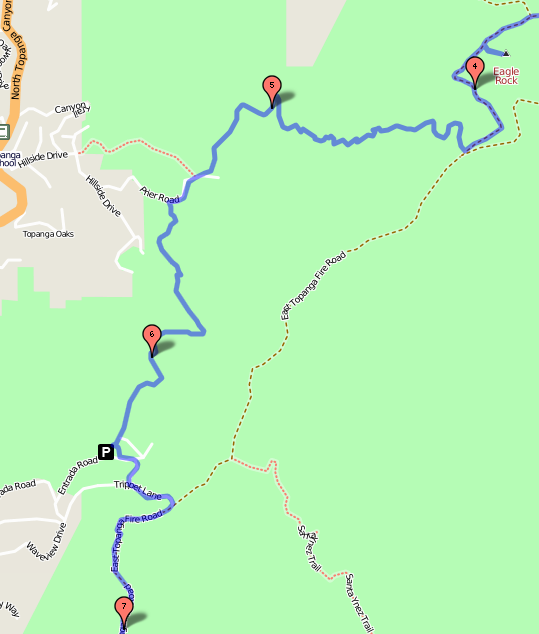 There is one part after Eagle Rock where one must head off of the East Topanga Fire Road, onto the smaller Musch Trail which heads towards Trippet Ranch. In the past, the group would come to this point and be unsure of where to go. In fact, the first March may not have even gone down this route. But after years of arguments, the Musch trail became the dominant route. Really, there is no correct trail as either way will get you where you are going. 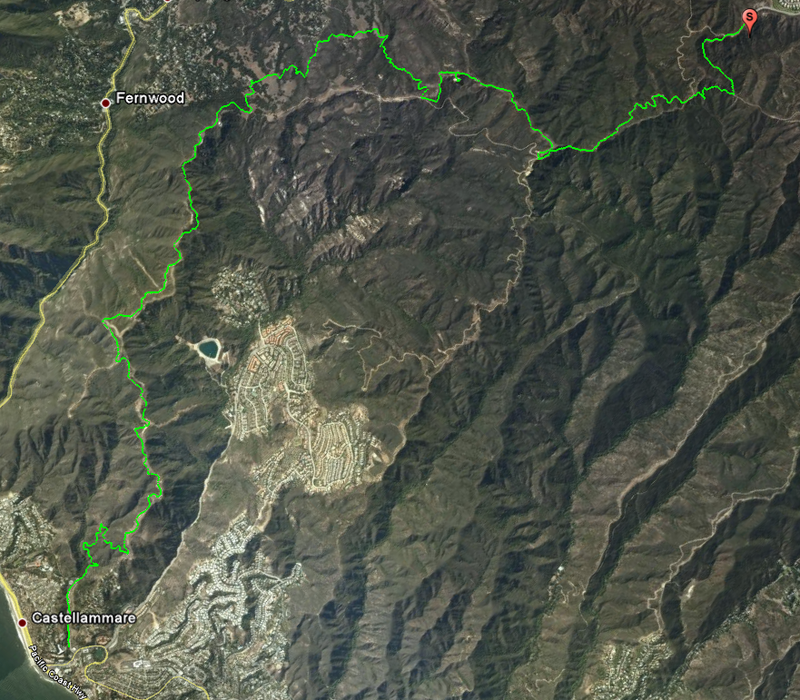 Actually, the larger East Topanga Fire Road will get you to the ocean much quicker, cutting about 3 or 4 miles off the total route. 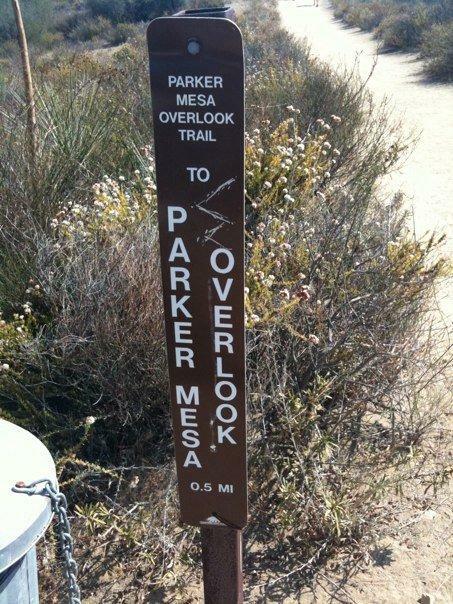 But that would also skip the next two spots (and thus the only water on the trail!). Once on the Musch trail, one tends to bear left at the random forks. The trail is better these days with signs and rocks pretty much saying where to go, but people seem to get lost on this part occasionally. Musch Camp (down the Musch trail, which is usually pronounced “Munch,” but correctly pronounced “Mush”) is a watering hole and backpacker’s campsite that is one of the few spots where running water and shade can be found. Usually the group takes a break here and refills their water supplies. The first year that they found anyone camping here was 2009. The Boy Scout troop was rather surprised by the March rolling through. Since then the camp has been used more often. Between Musch Camp and Trippet Ranch lies the Altar of Freedom. It is just up the hill from the random water spigot where the trail meets with Prier Rd. It was discovered on Ace’s Absentee March in 2008, and thus added as a Spiritual Stop on 2009. The “Patriot” Achievement can be earned here. Ironically, the trail up to the Altar of Freedom has been closed since 2015. Trippet Ranch is a former Gentleman’s Ranch. This is the only point on the route that has access to roads and thus the place where people have the opportunity to give up. This is the ending point for most incomplete marches. When you arrive at the parking lot, there are restrooms and a shade structure (that was rebuilt sometime between the 2011 and 2012 marches). This is the half-way point (usually). From here, head up Entrada Rd to Trippet Ln, past the Latitude (close to but not quite N 34° though, actual N 34° is about 3 miles out to sea from the ending point), and back on to the East Topanga Fire Road. 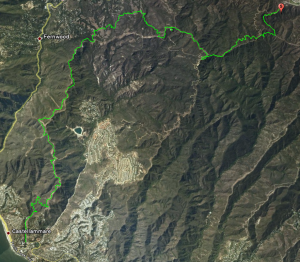 After Trippet Ranch, the trail meets up again with the East Topanga Fire Road and there is a long climb that goes up to about 1500 ft. elevation. It then stays up this high for a while, going up and down (the general lore states there are 3 hills, but this is somewhat disputed), before it then descends down to sea level within about 2 miles. This is the long home stretch (and second half) of the hike without any particular stops, partially cause there is hardly any shade on this part. By heading right at a large fork on the highlands, one can arrive at Parker Mesa. From here, the views are amazing. You earn the “Head in the Clouds” achievement by visiting this spot. There is a trail from here down to either Los Liones Dr. or even Topanga Canyon Blvd.! The latter is what is described as part of the Lemming Hike. Though this is not an official part of the Death March, people seem to accidentally go here quite often. It has been suggested that this be a scheduled stop, despite the fact it would add a few miles to the route since the two outlets from there are well hidden and most people backtrack. Originally, the route lead down the trail out into a neighborhood at Paseo Miramar. In fact, this is preferable on a bike ride. 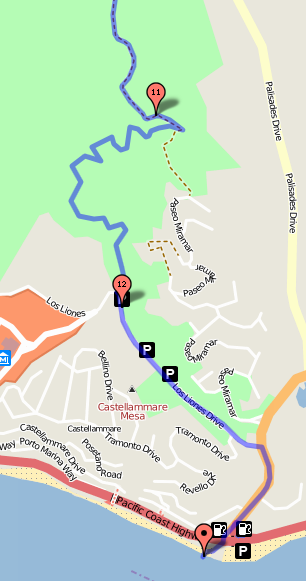 However, when hiking in the middle of summer, a slight turn to the right along the Los Liones trail takes you winding through lush foliage and out on to the cul-de-sac at the end of Los Liones Drive. From there, it is down to Sunset and then to the end. Gladstones is a popular seafood restaurant that is the end of the Death March at the corner of Sunset and PCH. Tradition holds that participants must touch the ocean water. In the old days when the group was smaller, many would consume peanuts out of Jesse’s Hat. Of course, eventually alcoholic beverages became the main draw. That being said, Gladstones has been “closed for private party” quite a few years, so the Timekeepers Cabana (on the beach below) has become the prime hangout spot. In 2016, news of Gladstones closing and the lack of a timekeeper lead the March to have beers and cocktails there as a sort of farewell. The old route from Reseda to the Bent Arrow Train runs from the Caballero Canyon Trailhead on Reseda Boulevard’s east sidewalk (just past a large gated community), through a narrow valley filled with small rocks and chaparral vegetation along Avenida Oriente, and up onto Mulholland, on which one must head west several steps before reaching the cougar sign. One can take a small trail that leads toward the hub if they take the first trail, but they must watch out, there is a second trail up the hill at the same place that goes nowhere. This route was traditionally chosen for partly for aesthetic reasons and partly for a greater challenge (much energy is expended going up the grade from the valley floor onto the ridge that Mulholland traverses). It was also closer to a founding member’s house. It fell out of favor around 2006 as the March grew to a size that required a more central meeting location. The legend of the “Wirebreak” has often been spoken of, but never traveled. The legend first came up during one of the early Death Marches, if not the first, when Josh said there was another route. This “Wirebreak” route was much more strenuous than the normal route and would liquefy all but the hardiest travelers. It turns out Josh and his mom went on the “Wirebreak” route, the first time they made the epic trip, led by the Sierra Club. The route went into the canyons which are incredibly lush but then require massive incline to get back to the ridge. The wirebreak, is the specific part of the route that is long and very steep that went from the canyon to the ridge. Maps of the area include a few places with the word “Firebreak” along ridges. Satellite images of these areas show bare lines. These firebreaks travel along the ridges and would obviously provide a challenge with their extreme elevation changes. 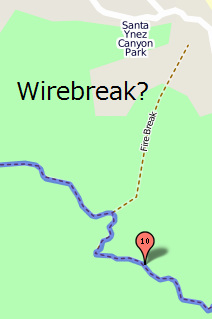 Therefore, it can be surmised that the mythical Wirebreak is a path that follows one of the area’s firebreaks, and the name evolved from there. Another theory is that the term “wirebreak” is actually a bastardization of “water break” since marchers desperately needed to take breaks on this portion of route (i.e. “water break . . . waer break . . . wirebreak”). 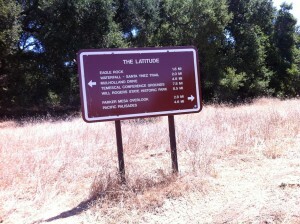 Research suggested that this is an alternate route from Trippet Ranch that heads through Santa Ynez Canyon/Trailer Canyon and comes out near the reservoir. From there, satellite photos show a bare path up to the ridge. Based off the topographic maps of the area, this would be a nearly 800 ft incline over a half mile. This is comparable to Castle Peak in the Simi Hills. Based on this research, Josh and Jesse were able to rediscover the end of the Wirebreak on the 2008 March. A random Sierra Club member explained the route in 2009. Although this lead to plans to send an expeditionary party down into Santa Ynez Canyon to figure out the exact path, the explosive growth of the Death March forced the members to worry about other pressing matters like keeping everyone from getting heat stroke. 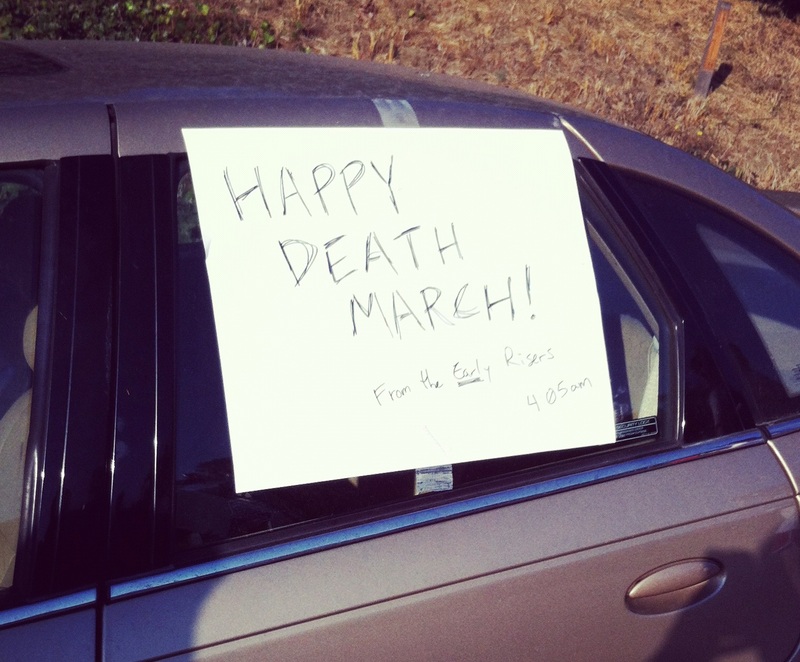 The Double Death March idea had been tossed around since 2009, but no one had attempted it until 2012. The idea is to leave your car at Los Liones and walk to the top of Reseda before the Death March begins. Earl and Jen were able to complete this in 2012, earning the “Early to Rise” achievement. No one else has completed this challenge to this very day.